The ability to experience these buildings, all within walking distance, presents a rare engagement. Designing a museum and academic building in this special historical and physical context was a unique opportunity. Conceived as a contrapointal, abstract, ambiguously scaled, “sculptural object” on Elmwood Avenue (one of the city’s main thoroughfares), the composition rotates around a cast stone rotunda, to a modulated brick rectilinear volume, establishing a collage assemblage that interpretively relates to a multifaceted context. The spatial sequence is intended to be dynamic, varied and unexpected, yet clearly referential to the exterior forms. The programmatic combination of exhibition and teaching spaces affords both an experiential richness and multi-use, that engenders vitality, as well as an inspirational sensibility that visionary architecture embodies. Housing a museum dedicated to the art of Western New York, the 84,000 square foot two-story structure is a highly functional organization of related program components, clearly divided into public and private realms. Spaces include the dramatic 147-foot long double height main gallery, a variety of other flexible gallery spaces, an auditorium, classrooms, museum store, café, public reception room, administration, boardroom, roof terrace and support functions. The building is clad in zinc panels, magnesium brick and cast stone, accentuating the formal articulation of the volumetric elements. The selected materiality is intended as both a counterpoint as well as a reference to the existing and nearby campus buildings as contextual precedents. 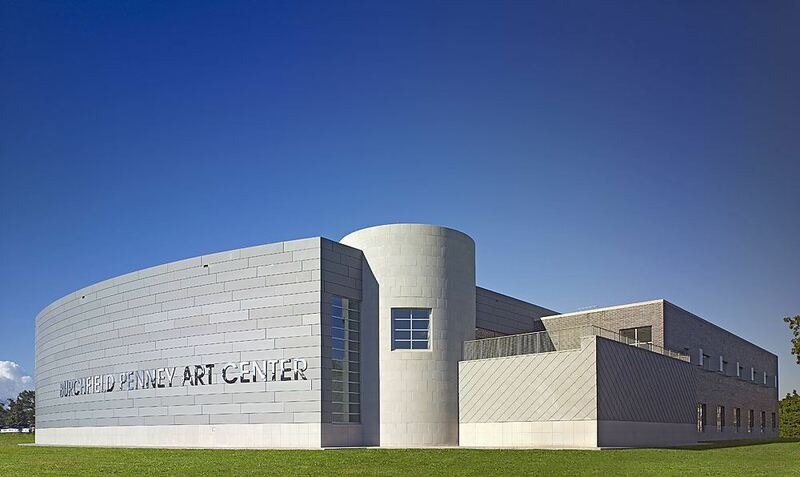 The first art museum in New York State to be LEED certified, and among the first several art museums in the nation to achieve certification, it has officially received LEED Silver certification from the U.S. Green Building Council. It meets rigorous standards in the areas of site sustainability, water use and efficiency, reduced use of energy and atmospheric impact, use of materials and resources, improved indoor air quality and innovation in design.